When Dear Husband and I invited family over for a party to see our new house this past weekend, I immediately began menu planning. I’m a firm believer that chips and dip ought to be a staple at any casual get together. So with that in mind, I decided to make a homemade queso to serve alongside my homemade guacamole and tortilla chips. 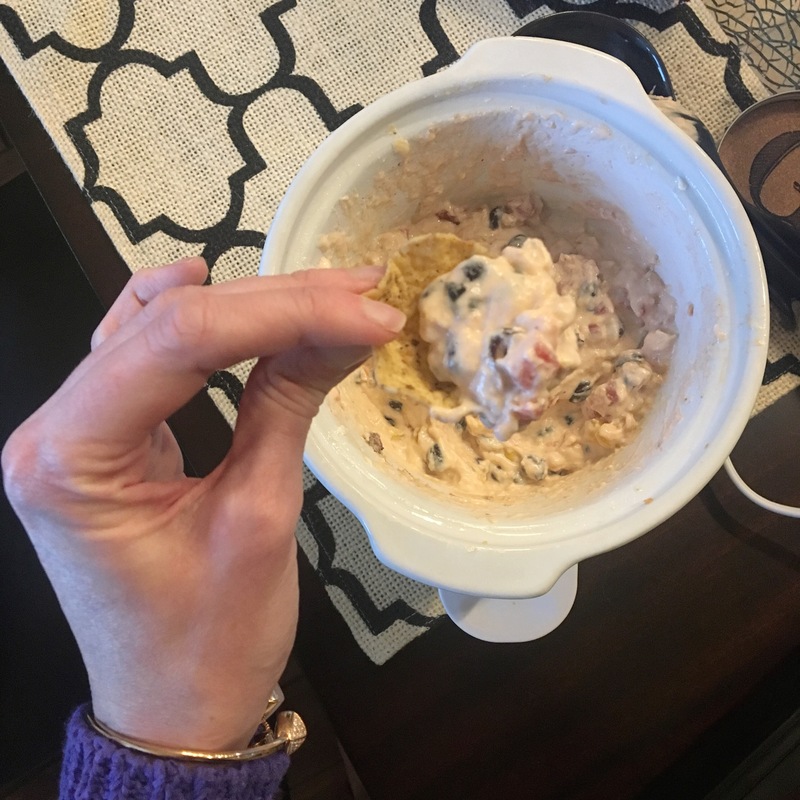 But not just any queso — kitchen sink queso! This queso is a Mosaicca original recipe and derives its name from the fact that you throw in everything but the kitchen sink! Corn, black beans, tomatoes, peppers, onions, garlic, herbs — you name it, it goes in. Had I any green onions, they would’ve been dumped in as well. As with many of my favorite dishes, this is a slow cooker recipe. Because it uses a whole block of cream cheese and package of shredded cheese serve as the cheesy basis, it is on the thicker and creamier side. You’ll want to cube your cream cheese before adding it to the slow cooker – it will melt more easily this way. The important thing with this recipe is to have it at the right heat level for the right amount of time, with plenty of stirring along the way. 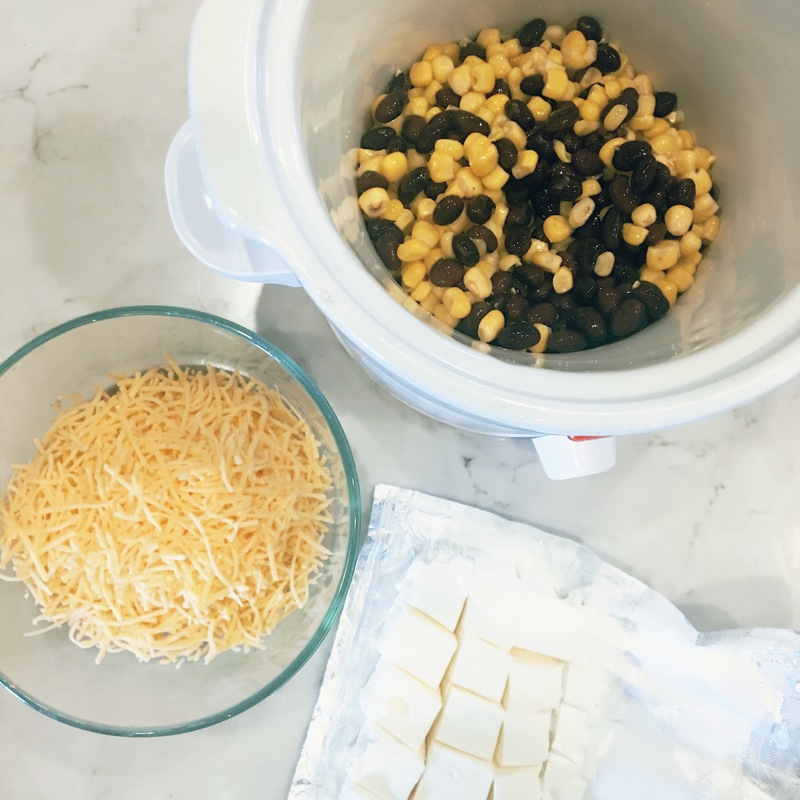 If your slow cooker is on anything hotter than the warm setting when it comes time to serve, the queso may literally be boiling. And you wouldn’t want to burn your guests, now would you? I didn’t think so. If you like things spicier, feel free to toss in more cayenne and chili pepper! Tell me, what is your favorite kind of queso? Cube cream cheese into 1 inch cubes. Add corn, beans, garlic, spices, and Rotel to slow cooker. Layer cream cheese and shredded cheese on top. Turn slow cooker to high and set for an hour. After an hour, stir contents and add more shredded cheese if stringier consistency is needed. After another hour, stir again and reduce heat to low. After another hour, reduce heat slow cooker temperature to the warm setting. Yum! But now I want CHEESE!!! YUM! 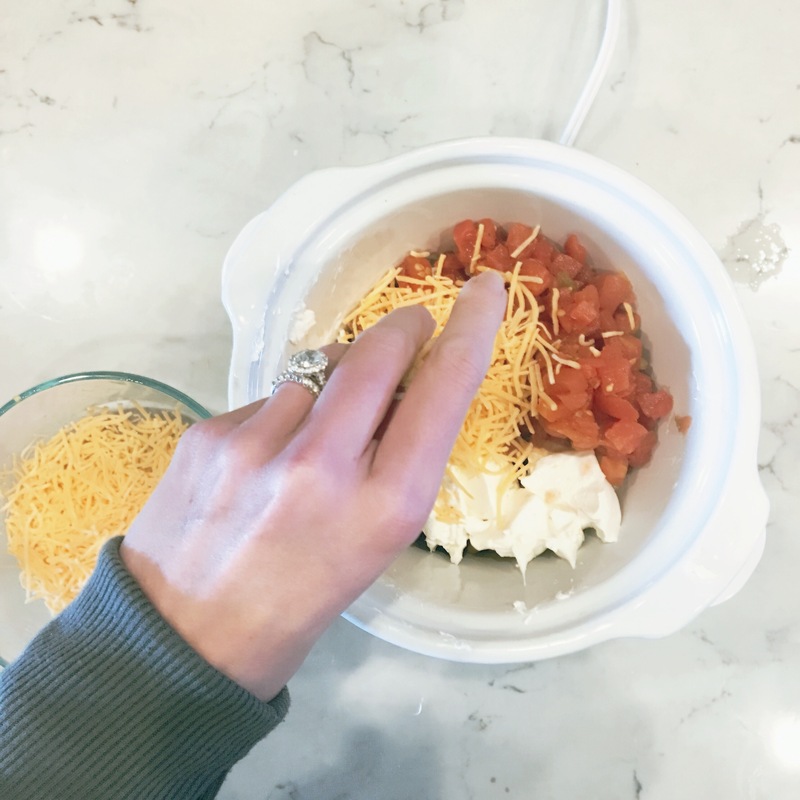 And I agree… Chips and dips are casual gathering staples!! This sounds like such a great recipe, I have to try it!!! I make really boring lazy queso that’s just velveeta + rotel but this sounds a billion times yummier! Hey, Velveeta and Rotel is a classic!! I’d say this queso is a lot thicker and creamier, not quite as runny of a consistency as V&R queso. But any cheese is good! You’re right, it is a classic! I prefer thick + creamy queso so this sounds perfect! Do you eat it with anything besides chips? This looks so yummy!!! I’ll have to try it! Never had queso?!? That, sir, is a travesty. Consider yourself invited! I’d love to see what your face looked like if I turned up on your doorstep in a few days. Haha. I agree, it is a travesty! If you turned up, I’d insist you have my homemade queso AND guacamole! In that case I’ll be over in five. Haha.